Step 1: Select TX Mode and then power it on. Step 2: Hold the power on/off button till you find the indicator quickly flash blue. cause it is one key operation, long press the power on/off button for one more second, the indicator will change. if you can't find light quickly flash blue, please turn it off and choose TX mode firstly and then restart it. Step 3: Turn on your bluetooth devices and make it into pairing mode. pls ensure that you have turn off the other bluetooth devices nearby. Step 5: Connected D-BT2 devices to TV/DVD with 3.5mm audio cable or red & white AV cable. Then it will work. Step 2: Hold the power on/off button till you find the indicator flash Red and Blue. Step 3: Turn on your bluetooth devices and then use your bluetooth devices to search and scan "D-BT2" and then connected. 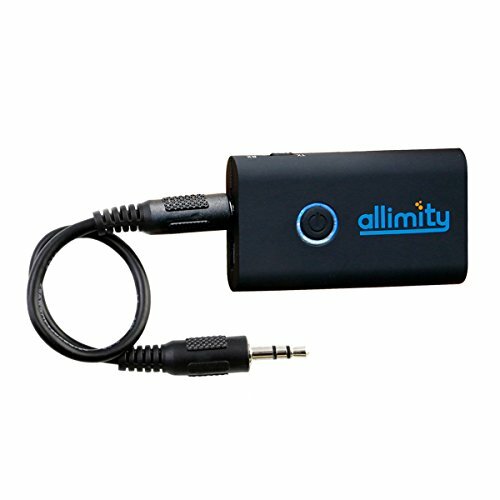 If you have any questions about this product by ALLIMITY, contact us by completing and submitting the form below. If you are looking for a specif part number, please include it with your message.